Formed in 1926, the Evelyn Bundy Band was one of the earliest and most influential local jazz ensembles to contribute to the Seattle, Washington jazz scene. Evelyn Bundy, who played piano, drums, saxophone, banjo, and occasionally sang, was born in Seattle into a musical family. Encouraged by her father, Bundy took up piano and studied with Frank Waldron. 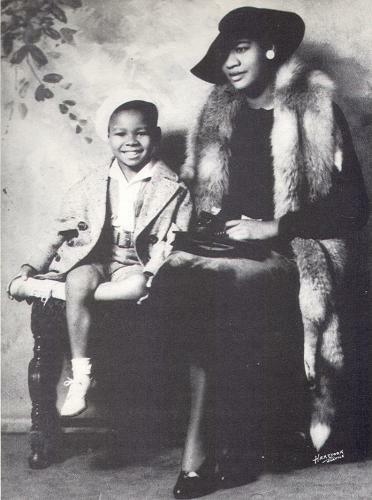 Bundy began performing professionally at the age of 13, with her mother accompanying her to most of her early performances. At Garfield High School, Bundy formed the band the Garfield Ramblers with classmate and drummer Leonard Gayton. In addition to Bundy and Gayton, the ensemble included brothers Wayne and Jimmy Adams on saxophones and trumpet, Creon Thomas on piano, drums, violin, and banjo, and occasionally Kenny Pernell on alto saxophone. Attending gigs in a band member’s employer’s hearse, the Ramblers performed at high school and club dances and local black society events. After Bundy graduated from high school the Garfield Ramblers changed their name to the Evelyn Bundy Band. Without recordings of the Bundy band it is difficult to gather what, exactly, they sounded like. Oral histories suggest, however, that the music was distinctly not of the Dixieland idiom. The two-beat Dixieland feel was replaced by a contemporary four-beat swing. Seattle jazz of the period was not particularly bluesy, favoring intricate arrangements and strong melody, characteristics likely shared by the Evelyn Bundy Band. Bundy’s son, Charles Taylor, Jr., who later emerged as a significant band leader in his own right, remembers his mother’s music as stylistically comparable to that of Duke Ellington’s orchestra. He also recalls Evelyn Bundy as a modern, two-handed pianist possessing a sophisticated touch. Performing in local nightclubs, the Evelyn Bundy Band contributed to the foundation of what would become a thriving and authentic black jazz scene centered at Jackson Street and Twelfth Avenue. And in the 1930s, with husband Charles Taylor, Bundy hosted regular social gatherings and late night jam sessions in her home. While offering social and economic support to local black musicians, Bundy also entertained such recognized visiting musicians as Lionel Hampton and Erskine Hawkins. Band members Jimmy and Wayne Adams continued to perform music well into the 1930s. Jimmy Adams led his own band from 1931, once billed as the “trumpet king” at a local summer ball. Ultimately, he would commit suicide. Wayne Adams joined Earl Whaley’s band in 1934 and left Seattle. After graduating from high school in 1927, Leonard Gayton began leading his own bands, though with limited success. Evelyn Bundy stopped performing with regularity in 1937. Paul de Barros, Jackson Street After Hours (Seattle: Sasquatch Books, 1993); Norman H. Clark, The Dry Years: Prohibition and Social Change in Washington (Seattle: University of Washington Press, 1988).